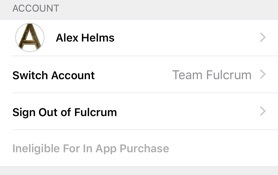 An overview of the settings options found in the Fulcrum for iOS app. The app settings screen is not just for fine tuning Fulcrum for your use. 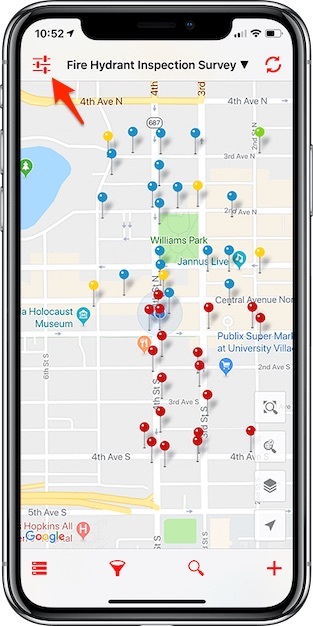 This is also where you will change basemaps and/or download them to your device, sign out of your account, and much more. 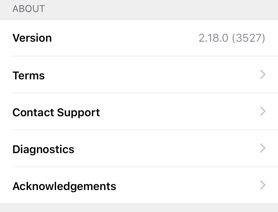 To access the Fulcrum settings page you can click the settings icon in the upper left part of the screen. View the account and organization context you are currently using. You can switch which plan you are accessing if you are a member of more than one plan. In addition, this is where you can sign out of Fulcrum to switch to a different context. The list view settings allow you to adjust the sorting options. You can adjust your list view sort options by title, status, date/time created, or date/time updated. Also you can change between the sorting order. Allows you to set the sync functions. You can choose to Auto-Sync after launch and choose whether to automatically sync records after record edits. Auto-sync only pushes the saved record up to the server and does not pull down any other changes. By default, Auto-Sync is off. Allows you to set the sync settings for media files. This includes: Photos, Videos, and Signatures. You have three sync settings to choose from: Cellular or WiFi, WiFi only, or Never. Adjust the capture quality and whether or not to save the photos taken during data collection to the camera roll. Adjusting the picture quality can have a big impact on sync times, cellular data consumption, and the amount of media storage your photos consume. When Save to Camera Roll is enabled, a copy of the image taken will be stored locally in the photos app. Adjust the video quality and whether or not to save the videos taken during data collection to the camera roll. Adjusting the video quality can have a big impact on sync times, cellular data consumption, and the amount of media storage your videos consume. When Save to Camera Roll is enabled, a copy of the video taken will be stored locally in the photos app. The Data management section has options pertaining to the data and media that is stored within the Fulcrum database within the mobile app. You can clear the synced data or media files, as well as, clear default values that are currently stored on your device. 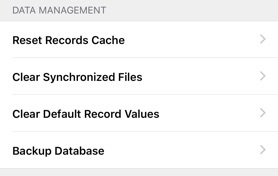 Resetting the stored records cache will remove all cached records on the device. Any records that have not been synced will not be removed. Details on resetting the record cache can be found here. This option will clear all synced media files off of the device. This can be used to free up storage space on the device. Clearing the default record values will clear all values that have been saved on fields that have default to previous value enabled. Backup Database will create a backup of the data currently on your device. This backup file is not readable by Fulcrum and should only be created if instructed to do so by a Fulcrum support staff member. View the current version and read the terms of service. Additionally, a link to contact support (via Email) is under this section. There is also a diagnostic link which will take you to a page where you can view the storage details, memory details, and server details. If support ever asks to send logs to them you can send the logs through this page as well. Security is where you can set to leverage Face ID to log in and also set the time limit before you will need to reenter your password. More details on this can be found on the security page. This will provide you with a total number of records that are stored in the Fulcrum mobile app that have not been synced to the server. This count will include records that have failed to sync, are saved in a draft state, or have not been synced yet. You can use the upload status for records on the record list view to determine the state of individual record.